Campbells Cream Of Mushroom Soup 1941 Ad. This color 1941 ad states Once a special party soup. Now a favorite family treat. Campbells Cream of Mushroom. Recipe for Chicken A LA King. Picture shows woman and boy eating bowls of Campbells Cream of Mushroom Soup. Magazine tear sheet picture is taken through plastic and may show wrinkles or crookedness that is not in the ad. This Original magazine tear sheet measures 9 3/4 inches wide by 13 1/4 inches tall. 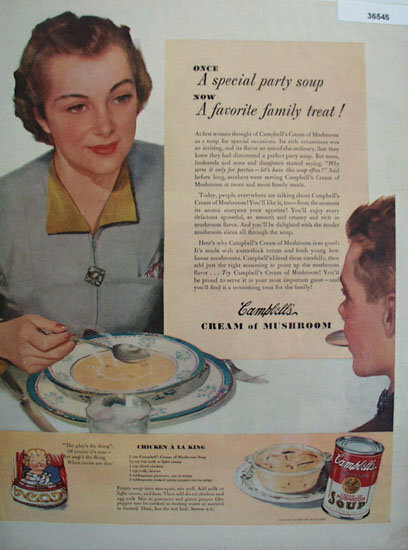 Items Similar To "Campbells Cream Of Mushroom Soup 1941 Ad"